SEATTLE - Washington residents have access to 13 new, year-round safe medication disposal kiosks in select Walgreens locations throughout the state, thanks to a new partnership between Regence BlueShield and Walgreens. Safe medication disposal kiosks at Walgreens pharmacies allow consumers to safely and conveniently dispose of unwanted, unused or expired prescriptions, including controlled substances such as opioids, year-round at no cost. Kiosks are available during regular Walgreens pharmacy hours and offer a safe, convenient way to ensure medications are not accidentally used or intentionally misused by someone else. Where: Tacoma Walgreens location, 4315 Sixth Ave.
Regence-sponsored safe medication disposal kiosks are now available in the following communities at these Walgreens stores: Seattle (5409 15th Ave NW), Lynnwood (20725 Highway 99), Kirkland (12405 NE 85th St.), Burien (14656 Ambaum Blvd SW), Kent (25605 104th Ave. SE), Tacoma (15225 Pacific Ave S, and 4315 Sixth Ave), Lakewood (9505 Bridgeport Way SW), Vancouver (1905 SE 164th Ave), Mercer Island (7707 SE 27th St.) and Olympia (1510 Cooper Point Rd SW). Two more kiosks are scheduled to be installed in Seattle later this year. The expansion is part of a joint effort by AmerisourceBergen, Blue Cross Blue Shield Association, Pfizer, Prime Therapeutics and Walgreens to combat the national opioid abuse crisis by increasing the availability of safe medication disposal kiosks to an additional 900 Walgreens drugstores around the country. When the expansion is complete, kiosks will be available in approximately 1,500 Walgreens stores nationwide. Safe medication disposal kiosks have collected more than 270 tons of unwanted medications since the program began in 2016. 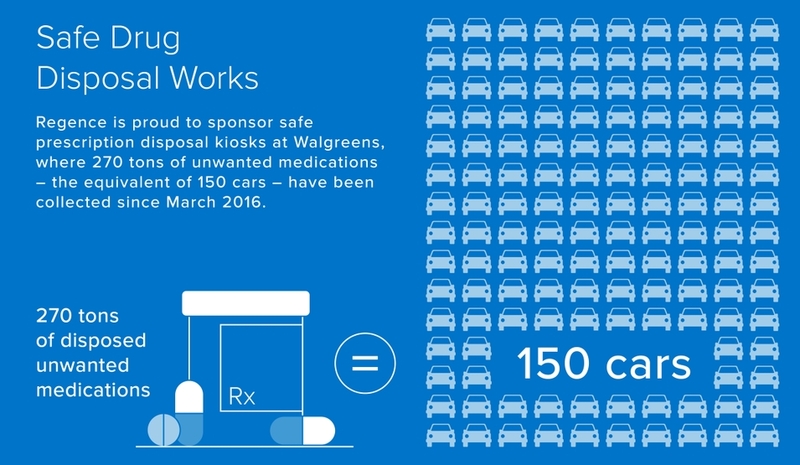 This an additional 115 tons since Walgreens announced its partnership last fall with leading health care organizations to expand the availability of safe medication disposal kiosks. Walgreens (walgreens.com), a provider of trusted care in communities since 1901, is included in the Retail Pharmacy USA Division of Walgreens Boots Alliance, Inc. (NASDAQ: WBA), the first global pharmacy-led, health and wellbeing enterprise. Approximately 8 million customers interact with Walgreens in stores and online each day, using the most convenient, multichannel access to consumer goods and services and trusted, cost-effective pharmacy, health and wellness services and advice. Walgreens operates 8,100 drugstores with a presence in all 50 states, the District of Columbia, Puerto Rico and the U.S. Virgin Islands, along with its omnichannel business, Walgreens.com.